No matter whether you are a complete beginner wanting to take up a new hobby or have been using machines for years and have your sights on a new one as a treat, finding the perfect sewing machine can be a challenge. From the number of stitch variations and threading technique to the control, size and buttonhole ability, there is a lot to look for. There is also a lot of jargon, and hundreds of models to choose from. Thankfully, we have narrowed them all down to our best ten, and no matter what it is you’re looking for, there should be a machine in the list which is perfect for you. While beginners need a basic and easy to use machine, they’re also going to want one which can allow them to continue their new-found passion for a good little while. This machine is a perfect balance. Easy to use and navigate, yet just enough extras to make that much-needed step up in terms of allowing them to improve their talent. However, don’t think it isn’t for you because you’ve been sewing for a few years; it is the model which is going to be featured in The Great British Sewing Bee 2019, so it is for the experienced crafters out there too. There are 24 stitch variations to choose from, including a one-step buttonhole setting which makes life easier. A built-in needle threader will get them on their way much quicker, and a bright LED light will allow them to work even in low light conditions. Stitch length and width can be adjusted, and the strong motor seems powerful enough to be able to power through thicker layers and tough tasks. A drop feed facility will also allow you to do some freehand tasks, so if you want to practice a bit of embroidery, feel free. The 725S has replaced the popular previous 525S and is Janome’s newest model. With every purchase, you get a hardcover to sit over the top when it isn’t in use, and it is controlled with a two-speed foot pedal. Great for beginners and experts in one, this is one of the easiest sewing machines to use yet performs incredibly well. Just as the name suggests, this sewing machine is for anyone who will need to use it frequently and tackle a range of tough fabrics. The motor is up to 60% stronger than most ordinary machines so that it can power through denim, leather and stretch. All this can be done at speed too, making it not only robust but fast. There are an impressive 32 stitch varieties and a one-step buttonhole function. The thread tension is automatic, so superior stitch quality is no effort whatsoever, and a reverse function will allow you to reinforce the end of the stitching. A twin needle will also allow you to produce parallel rows of stitching which are completely equal. Everything is held together in a steel frame, so there is no risk of it coming out of alignment; just let it do the work for fuss-free sewing. The solid plate is also stainless steel, so can allow fabrics to glide across without risking becoming caught and snagged or crumpled. Despite the heavy-duty name, it is only 6.4kg so you can easily pack it up and take it to a sewing class, or round to a friend’s house to rescue their outfit for a big occasion. The price is actually great for what you get, as it isn’t much more expensive as some of the high-end basic models, so could well be worth spending that little bit more for something which will massively broaden your horizons. It isn’t the prettiest, but that is soon forgotten once you get to grips. great for anyone out there who knows their way around a sewing machine, this is a capable appliance and the price is excellent for a more intermediate model. An incredibly popular choice amongst sewers new and old as well as those who have had a few years away, this sewing appliance is our top bargain pick – but that doesn’t mean it is any less of a machine. It is great for any of you out there who are taking the plunge with their first ever sewing machine. Not only will it not break the bank and get you used to working the device, but there is still plenty to get you well equipped. Fourteen stitch options and the ability to tackle light and medium weight fabrics makes it great for alterations, mending and light projects. There is the ability to use a twin needle, although this is an extra purchase. What you do get, however, is a dust jacket, foot control darning plate, standard and buttonhole foot, seam ripper, spare bobbins and some spare needles. Plenty to get you going until you get a real feel for how it all works. The buttonhole function is four step, which still isn’t incredibly excessive, and an LED light can illuminate whatever you are working on. An electronic foot control lets you take it as fast or slow as you are comfortable with while allowing you to maintain full control with your hands guiding the fabric. It is easy to set up out of the box, and the instructions help you out enough. For the price, we think you get a generous amount for the money, and there is a two-year guarantee so if there are any problems with the appliance in this time it doesn’t mean you’ll have to fork out for a replacement. A very affordable yet very capable machine - it is no wonder it is incredibly popular among both newbies and seasoned sewers. The most basic we reviewed, but still high in performance. Whether you are a complete entry-level sewer who just wants to get a feel for the appliance, or you just like to have something which makes tacking up any trousers or dresses a bit easier, it is great for helping. Maybe your teen is studying textiles at school or college, and they will need something for home use occasionally, or your child wants to start some basic sewing and embroidery as they’ve seen you power through quilts and dolls clothes. Whatever the need, the whole back-to-basics approach was a welcome one during our review. It isn’t overly complicated and doesn’t try to reach out of its abilities. There are eight stitches, as well as a four-step buttonhole function. Perfect for both simple tasks and decorative sewing. Each is simple to choose, with a dial allowing you to select and change them with no issues. Stitch length and width can also be chosen, to prevent your stitching bunching and to make it more or less pronounced. All of the internal parts are held together by a metal build, so there is little risk of anything becoming unaligned – you will have skip-free sewing no matter the project. Our only issue is that the thread reel sits horizontally with no option to move it vertically, so occasionally the thread became very tight with some more high-pressure tasks and eventually snapped. Basically, it couldn’t turn quickly enough. Not a massive issue if you will be taking it all slowly though. Overall, the price is great, especially as it is so good at the tasks at hand. It may be basic, but it won’t let you down. Basic and affordable, yet still performs much better than we expected. Despite the slightly confusing name, this is not a manual machine. It is an electronic one, with a foot controller, but just requires you to do quite a bit of the setting up yourself. To say it is a ‘basic’ model, there is a lot going on. A reverse lever will help you to reinforce end stitches, and a drop-in bobbin makes the entire threading process easier. When it is in operation, it is very quiet. To actually get it operating is very quick, effortless and a rather seamless process. The DVD instructions are very easy to follow, more so than the manual if you are a visual learner. Everything is easy to choose thanks to the selection dials, from thread type to length and tension. It is lightweight so doesn’t feel cumbersome to use, and the design is simple yet clean and modern. All in all, there are enough features and design features to cover the majority of jobs that any home sewing machinist will need it for. We’d say it is one for those of you who will be doing the odd repair job, shortening clothes or adding a few extra touches as opposed to any professionals because it isn’t the most substantial, but that is probably demonstrated in the price. Plenty of features and handy little extras will easily let you sew to your hearts content. 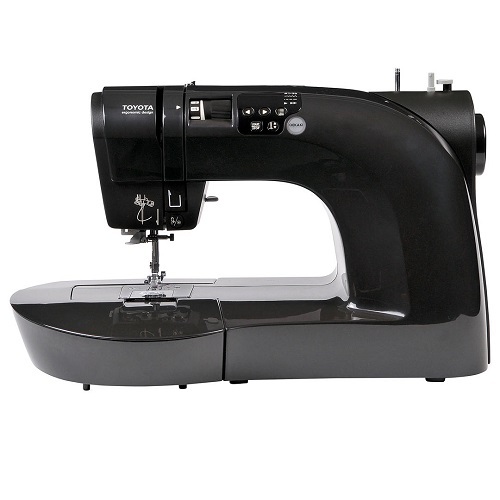 Whether you are low on space in your home or you simply want a small machine for dealing with slight adjustments and alterations, this mini sewing machine has a lot included for the size and price. There are 12 stitch types, which is perfect for the basic tasks and hobby sewing. A reverse button will allow you to strengthen any ends, so they remain in place, and the 2 kg weight not only makes it great for transporting and popping away after use but also makes it quite smooth to control. Quite a lot of other reviewers have mentioned that it was the perfect sewing machine to allow younger generations to learn. So whether they have seen you rustle up some craft magic, want to learn a new hobby or are taking textiles classes at school and need a bit of extra practice, it is great for anyone getting to grips with the task. There are two set speeds for anyone who thinks that the idea of controlling the speed with a foot pedal is a bit daunting, and it does well coping with small repairs. If you wanted to move on to quilting or more advanced sewing, you’d need something a bit more extensive, but because it is great for little tasks and no-frills sewing, we can see it being a handy little machine for even the most experienced of sewers out there. Our pick for the best mini sewing machine on the market. Whatever your reasons for purchasing it, it will help you out with all your sewing tasks. If you are ready to take your sewing to the next level, then a computerised sewing machine is a huge jump. This model makes that leap easy, though. The basic draw of a computerised sewing machine is that there is no foot control. Instead, you set the machine to go at a certain speed, and the slide speed control does it all for you. An LCD screen makes choosing your exact stitch a breeze, and there are even some embroidery options to allow you to extend your reach. Three needle positions make it that little bit easier to manage your task and get it precise, and there is twin needle capability too. There is a buttonhole foot, overcasting foot, monogramming foot, zipper foot, zigzag foot, blind stitch foot, button fitting foot all included, and some extras too such as bobbins, a needle set, tin needle, cleaning brush, screwdriver and extra spool pin. You do get a foot controller included, in case the start/stop automatic function and slide speed control is a bit overwhelming for some of the more gentle tasks. Or maybe you are simply just a traditionalist. One thing we did like was the digitalisation as if something was wrong, it told you what it was. No more checking everything twice and realising it was an incredibly minor issue with the thread or needle position, just go straight to the issue. Even the traditionalists will love that. Moving on to the price – it is actually cheaper than some of our overall top picks and has almost twice the features and stitch types. Plus you get a DVD of instructions and tips which comes in handy, especially if you are a complete beginner but want a machine which will help you to learn fast and throw yourself into it. We’d say it’s a bit of a bargain. If we are going to be picky, the fact the thread cutter is on the left rather than the behind the needle could be hard to adjust to (but it is a benefit it has one at all). The lighting also isn’t great, so while it can do a lot of the work for you, you will still need to sit somewhere with plenty of light. One of the best simple computerised machines, for any usability level. Suitable for beginners wanting to take their new found hobby seriously, right through to experienced machinists wanting a change. It is a computerised machine, but more on the entry-level side for the model type. There are 50 stitch variations, which includes some embroidery options, and you get three buttonhole styles to work with. In OEKAKI mode, the stitch width can be adjusted by controlling the pressure on the foot pedal which creates a patented paint brush finish. Ideal if you know you will be creating some thinker embroidery styles. The big selling point is perhaps the fact it is incredibly powerful; capable of piercing through 12 layers of denim, if you use a thick thread, to be precise. There are plenty of extra bits and bobs you get with it, from a zigzag foot, zipper foot, overcasting foot, blind stitch foot, gliding foot, embroidery foot, non-stick foot and buttonhole foot to buttonhole cutters and a needle plate screwdriver if ever needed. So if you’re starting afresh and need all of the extras to go with it, you’re pretty on your way. A well-priced computerised machine which has a lot of adjustment scope to help you on your way to crafting glory. 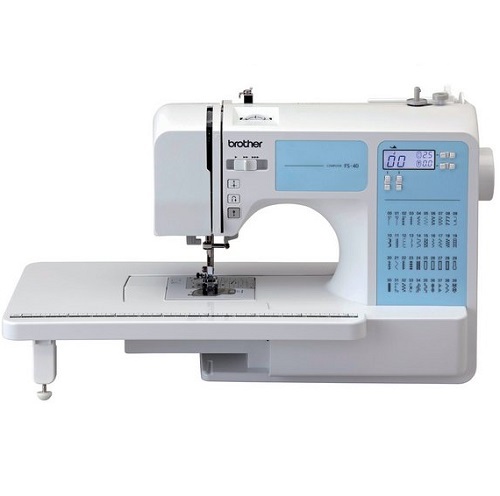 Nicknamed the “Quilter’s Companion”, this is a machine for anyone who takes sewing very seriously and pretty much relies on a good model to help them along. It is a specialised machine designed for quilting as well as sewing, as the name suggests. The generously-sized backlit LCD display makes choosing your settings easy, and there are easy to follow icons which will guide you through the entire process. This is good, as there is a huge number of stitch varieties. You can even customise them, creating your own versions and saving them to a memory bank for a later date and further use. This is great if you are a crafter and love designing personalised or unique pieces. There are three alphabet styles, including foreign lettering, and ten buttonhole designs (which we are sure will definitely keep you going). A stop/start button is present, but there is also a foot pedal in case you want a bit more control over the speed or to quickly switch it up. To make it easier, a twin lamp illuminates the work, and an automatic threader will save you some time when you’re getting set up. You get over 12 different feet with the purchase, as well as guides, seam ripper, spools and bobbins. The price may be steep but for the quality, it is pretty generous we’d say. If only the best is good enough, then this sewing machine is a great option and gives you plenty of choice. If we are going to review a rundown of the best sewing machines, then it is only right we include the best overlock machine on the list for any advanced users out there. This particular overlock machine has four varieties of stitching, able to cut as they go. Also included is a fast lower looper threading system and a free-arm/flat-bed convertible sewing surface for when overlocking cuffs and sleeves. There is a bright LED sewing light so you can clearly see what you are doing, and you get quite a few accessories which will help you out. 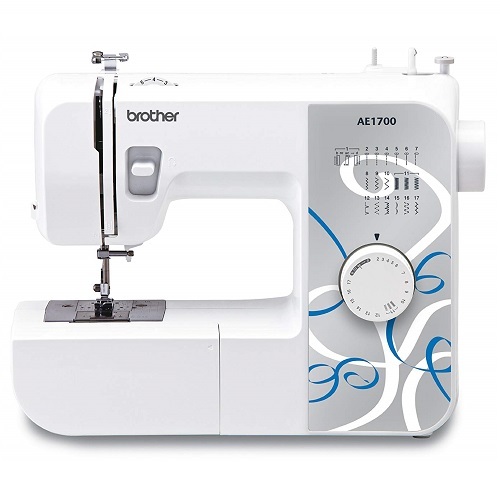 This Brother machine is the top pick for us because we found the instructions very easy to follow, with a colour coded guide for each thread. The actual threading was also easy, as a little latch takes it towards the needle. No having to put your hands perilously close to the workings. As people who had no previous experience with this form of machine, this was all welcome to us and a lot simpler than a few others we worked with. So if you want to give your materials and crafts a completely professional finish, this machine can help you out massively. There are cheaper ones available, but we can imagine they’re not as sturdy or reliable. The quality of this machine reflects the price. It may seem a lot for what it is, but if you want a truly professional touch to your sewing then an overlock machine is needed. This particular one was easy to use, and will keep you going for years to come. The most common type of sewing machine. They’re powered by a single motor and operated with a foot pedal, which frees up both hands for guiding and controlling and guiding the fabric. There is often a dial which allows you to choose stitch types and widths for simple usability. Great for beginners right through to experienced machinists. For more complicated tasks, computerised sewing machines are the go-to option. Several motors all control various aspects of the appliance, from the stitch speed to the actual needle up and down function. Stitches are selected through a touchscreen, and there is often a much greater range than with electronic models. They’re often pre-programmed with the correct tension, length and width for each stitch style. Many computerised machines have a memory function, which can remember past work and sometimes even allow you to create your own and save it. For the more advanced and frequent heavy-duty sewers out there. These are operated by turning a wheel on the side of the machine for the sewing action while guiding the fabric with your other hand. This makes them much harder to control than their electric counterparts, and they aren’t commonly found on the market nowadays. However, if you would like one because of the high level of control and intricacy they can offer (as well as a vintage design), they may still be available from specialist sewing shops. Designed to seal the edge of one or join two pieces of fabric together with an overlock stitch, cutting off the seam allowance as it goes. They aren’t sewing machines as such, but rather additions to your setup. Every machine comes with a guide to who it is best suitable for. This isn’t to say that a machine for a beginner is not for someone who has been sewing for 20+ years, or a machine for an intermediate user can’t be used by a beginner. It is more a guide on how easy they are to navigate. When choosing your new sewing machine, look at the variety of stitches, the size and the accessories you get, and compare them to your needs. What Does A Foot Pedal Do? Foot pedals control the speed and give the machine power. Most have a range of speeds, depending on how much pressure you press on the pedal. It gives you more control. Computerised machines can usually work with changing some settings rather than a foot pedal, but most models include one anyway to give you more control if needed, such as with more intricate work. Will I Need To Buy A Set Of Replacement Needles? Needles need changing depending on the thickness of the material you will be sewing and type of stitch (thick materials need a more solid needle, and thinner and intricate designs need a thinner needle). There may be some included, but if not, they will be available through the company or at a dedicated craft store. Advice on how to change them will be in your user manual. General advice is also that needles should be changed after 8 hours of use. They do become weaker, so replacing it can improve the stitch quality, reliability and the performance of the machine. If you are going to invest, you want it to last. Where Will I Be Able To Repair My Sewing Machine? Don’t be put off if you’re worried about it breaking and becoming an expensive item you barely used. If your machine ever needs repairs, a local sewing supplies shop should be able to carry them out. Information will be available through Google as to where your closest is. Some may only repair particular brands, so inquire first.